For most award show fans, the red carpet pre-shows are just as much fun as the award ceremonies themselves, and we are no exception. For the recent MTV Movie Awards, we created the entire outdoor set for the pre-show as they showcased celebrities arriving and walking the “blue carpet” (yes, MTV is that zany). Designed by noted set designers Dabs Myla, the award show interior featured a super fun, retro-influenced, 2D cartoon theme (think of those vintage “Let’s All Go to The Lobby” animated promos that encouraged you to visit the movie theater snack bar). In a clever twist, the pre-show, artfully orchestrated by production designer Julio Himede, was designed to look like a cartoon studio — with lots of hints as to what the audience was about to see inside. Working from concept art, SCPS built several large set pieces that reflected this cartoon studio theme, complete with a variety of artwork and preliminary sketches. But unlike a real cartoon studio, the art and sketches couldn’t be on paper but rather had to be created with materials that could stand up to any potential weather such as wind and rain. So we tested and used a variety of materials that would allow us to hand-bend the “paper” elements, printed all art with weather-resistant inks, and constructed everything to withstand 50 mph winds (give or take 40 mph). Elements we created included a fashion stage, various walls, and a 2D popcorn cart. 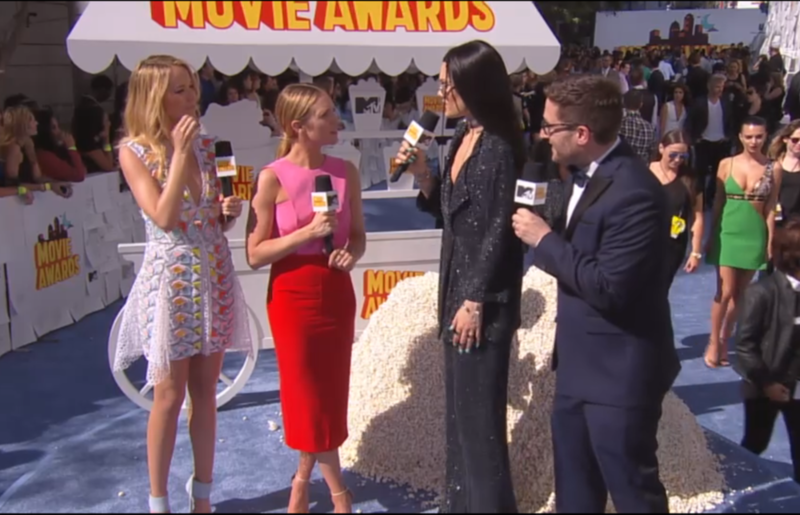 Perhaps the most fun we had was creating a “sculpture” for the interview stage — a huge mound of popcorn that we assembled so that it magically wouldn’t blow away in the wind. Amazingly, our intern didn’t flinch when we informed him that he would have to pop 2000 bags of popcorn — one at a time in our break room microwave (don’t worry, we were nice and only waited an hour — about 10 bags — before telling him we were just joking). Check out MTV's video highlights here.